Made in Germany, the AIRBELT K series offer the best lightweight, mid-size, commercial-grade canister vacuum cleaners on the market today! There are two models, each with different cleaning head options. Made in Germany, the AIRBELT K series offer the best lightweight, mid-size, commercial-grade canister vacuum cleaners on the market today! 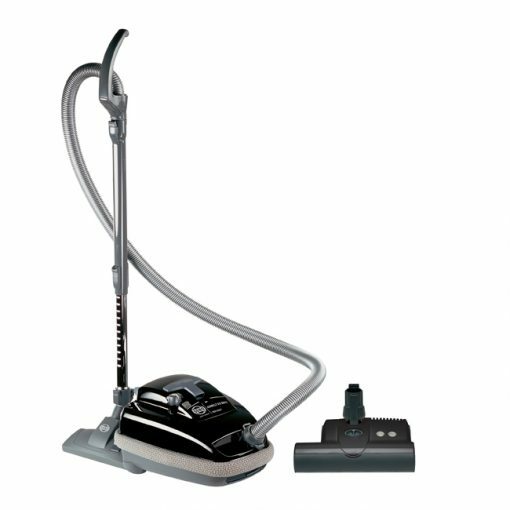 There are two models, each with different cleaning head options. The AIRBELT K3 includes the 12-inch-wide ET-1 electric power head, plus a parquet brush. The K2 KOMBI has a suction adjustment switch located on the canister body, while the K3’s suction adjustment switch is located on its ergonomically designed handle. The AIRBELT K3’s ET-1 power head effectively cleans carpets and hard-floor surfaces and has excellent pet hair removal! It also offers manual brush roller shut off for cleaning delicate flooring with straight suction. It has four-level manual height adjustment, and the extension side of its L-shaped contour makes cleaning under counters easy. It features tool-free brush roller removal for replacement or bristle cleaning, and a warning light illuminates when brush height is set too high for optimal cleaning, the bristles are worn, or automatic shut off occurs due to a brush roller obstruction, which protects the belts, motor and carpets from damage.